"[W]e called for social and political action," Ron Sider once explained wistfully, "[and] we got eight years of Ronald Reagan." In Moral Minority: The Evangelical Left in an Age of Conservatism, David Swartz explains how the call of Sider and other progressive evangelical activists helped catalyze a political revolution, but with consequences they did not foresee or intend. Swartz frames his story around a 1973 Thanksgiving weekend gathering that brought together many of the men and women now considered the luminaries of progressive evangelicalism: Jim Wallis, Richard Mouw, Sharon Gallagher, John Alexander, Samuel Escobar, John Howard Yoder, and Sider. The Washington Post enthused that these evangelical activists were prepared to "launch a religious movement that could shake both political and religious life in America." The assembled delegates, Swartz informs, were "convinced evangelicalism was up for grabs." Swartz thinks the delegates were right. In terms of political philosophies and partisan attachments, he argues, evangelicals in the early 1970s were a nascent voting bloc awaiting mobilization and direction. There was no reason to believe they would become stalwarts of the Republican Party. Indeed, in 1976, nearly 50 percent of American evangelicals cast their ballots for Jimmy Carter. Why then did the evangelical Left fail to fulfill its political promise? Swartz points to two primary expectations. First, much like both the New Left and the Democratic Party, the evangelical Left "fragmented along gender, racial, and ideological lines." Before they could plunge into grassroots politics or seek partisan political allies, the evangelical activists at the 1973 Thanksgiving Workshop immediately found themselves at odds with each other. Black evangelicals were angered by their marginalization within the group. After the delegates circulated a draft of what became the Chicago Declaration of Social Concern, women lamented its failure to condemn sexism, and Yoder complained about the document's demurral on the issue of war. Eventually, most delegates signed a revised declaration, but the squabbles signaled what lay ahead. Barely able to agree on a set of common principles, subsequent gatherings could not agree on a practical course of action. Second, the Democratic Party—drifting, despite its nomination of Jimmy Carter, "toward secularism and cultural libertinism"—made little space for progressive evangelicals. Here the issue of abortion was decisive. The 1976 Democratic platform recognized "the legitimacy of both pro-life and pro-choice views," and Carter himself walked a fine line between his personal opposition to abortion and his support for Roe v. Wade. 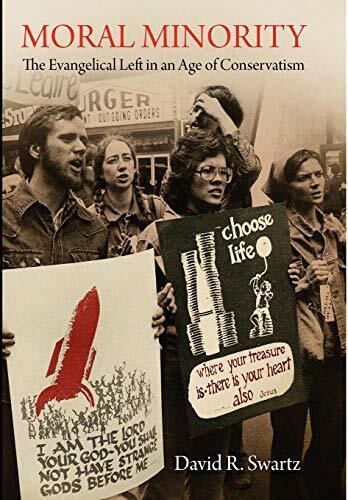 The 1980 party platform, by contrast, articulated an exclusively pro-choice position, and any Democrat wanting to remain in the party's good graces had to follow suit. Ted Kennedy, John Kerry, Mario Cuomo, and Bill Clinton were among the many to revise their positions on abortion. The issue of abortion made many Democratic politicians hostile to evangelicals, even if those evangelicals were progressive on other issues. For the most part, however, the Democratic Party often simply ignored the evangelical Left. An ardently pro-choice Democratic Party left a good number of moderate-to-progressive evangelicals in the political wilderness. The Republican Party, meanwhile, also narrowed and redefined its position on abortion, adopting an explicitly pro-life platform in 1980. More than any single factor, the emergence of the two parties' disparate stances on abortion married evangelicals to the GOP. The evangelical Left, then, did not fulfill its political dreams. Despite the sense of promise that pervades the early chapters of Swartz's chronicle, it never really had a chance. In 1972, before the emergence of abortion as a salient political issue, four out of five evangelicals voted for Richard Nixon, who with the assistance of Billy Graham assiduously courted evangelical support. Lyndon Johnson, Jimmy Carter, and Bill Clinton—southerners all—interrupted evangelical ties to the GOP, but they could not reverse the long-term trend. Yes, had the Democratic Party made room for pro-lifers, disavowed feminism and gay rights, and remained bellicose in its anticommunism, it might have attracted more evangelicals. Swartz is, of course, correct that the political trajectory of evangelicals "was more contingent than certain," but given the events of the late 1960s and 1970s, it certainly would have taken quite a lot for the evangelical wing of the silent majority to align itself with the Democratic Party. Nevertheless, Swartz assigns the activists in his book a theological and political influence that goes beyond such partisan realities. At a time when many evangelicals still kept partisan politics at arm's length, progressive activists "contributed to the broader politicization of evangelicalism." Yes and no. The progressives who coalesced around the Chicago Declaration may have furthered broad evangelical belief in the necessity of social and political activism, but many conservative evangelicals, including Billy Graham and Bill Bright, had already at least waded into partisan waters.